ALL MY WORK IS AIMED TO HELP IN RAISING CONSCIOUSNESS AND IN RAISING VIBRATIONS ON EARTH! This Lotus Orgone device was made with the intention to help in achieving balance between inner and outer world, connect the energy of heavens and Earth and integrate into a daily life, providing support, healing and cleansing. 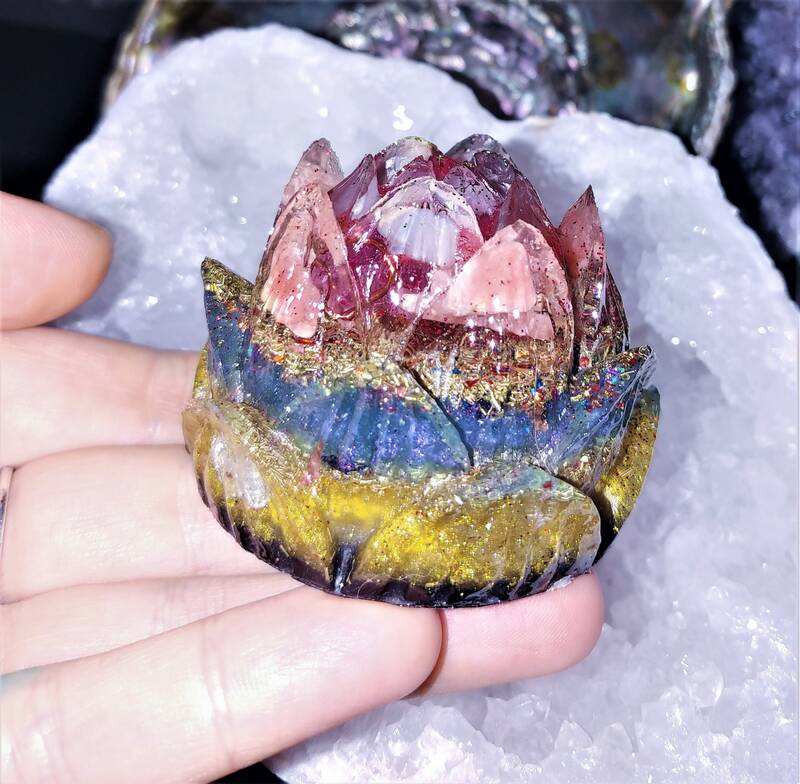 This Orgone Lotus flower will protect you from EMF radiation, will help in balancing and harmonizing energies, while connecting mind, body and spirit as one, activating your Chi channels and clearing all the negative energy in your body and around you. It will bring love, awareness and luck into your life. I make devices for those seeking to raise their vibrational frequencies and connect with their higher-selves. It is proven to generate negative ions and energies your surroundings with clean and positive energies. This Orgone paperweight is done in layers to assure the organic-inorganic layering for perfect performance (THE MORE LAYERS THE BETTER FOR CLEARING THE ENERGY). Crystals are cleared in ocean water and charged with sun light. While each layer was curing it was treated to the 528 Hz vibration of love and light.. It is approximately 2.5" tall. It is a powerful spiritual tool that will positively influence your environment and your life in all aspects: physically, mentally, emotionally and spiritually. It has the capacity to transform negative energy of lower vibrations into positive Divine higher vibrational energy. You can simply hold an Orgone device or be near one, and the negative energy will be cleared from your field, transmuting into a higher, more balanced and healthy energy. This is a practical tool that can create and maintain a positive energy field in your home and workplace for you and people around you. This paperweight was intended to aid Heart chakra, Throat, Third Eye & Crown Chakras, and is great for meditation and harmonization of any environment. It contains: Purple Aura Quartz Crystal Wrapped in Copper wire, Amethyst, Moonstone, Rhodochrosite, Strawberry Quartz, Rose Quartz, Blue Calcite, Shungite, Rose Petals, Sage, Shungite powder, Black Sun Iron Oxide, mica flakes, 24k gold flakes, copper coils, Clear Quartz crystal, metal shavings, epoxy resin, love and light.